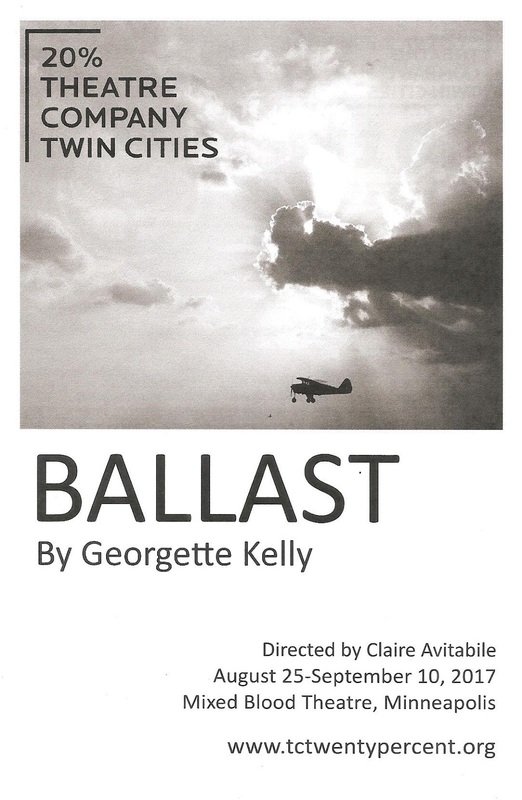 The play begins with different characters talking about their dreams. Not their hopes and aspirations, but where their mind goes when they're asleep. Their subconscious life feeds into their conscious life, and we begin to learn about what each is dealing with at this moment in their lives. 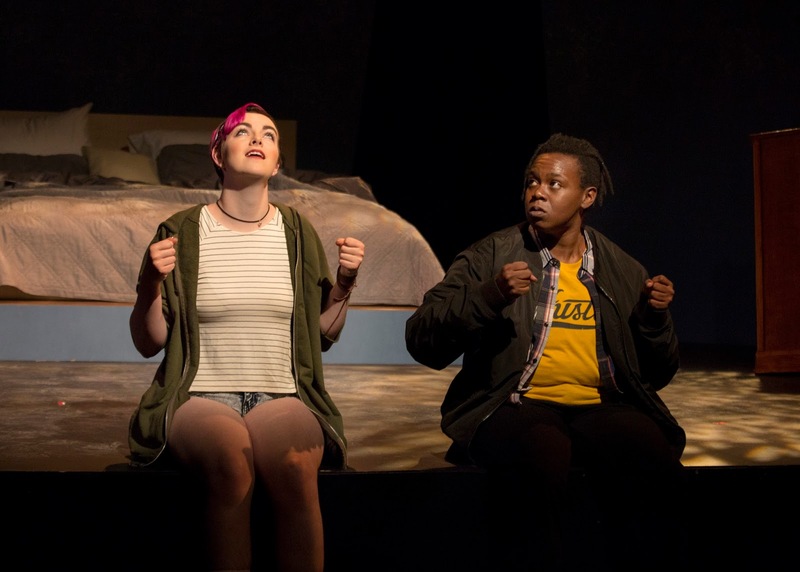 Grace (Eileen Noonan) has completed her transition into her true self as a woman, but her wife Zoe (Olivia Wilusz) is still transitioning into her new life. She's been as supportive as she could be throughout the process, but a part of her still misses the man she fell in love with, the life that they had together. 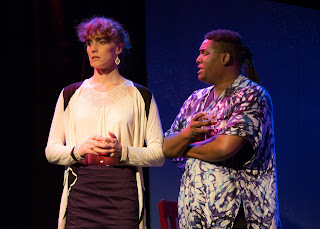 Grace is a pastor at a Christian church (of unnamed denomination), and her Bishop (Marcel Michelle, who ably transforms into multiple characters) tells her that while the church has no official policy on transgender pastors, it does forbid homosexual pastors. Technically, the church does not object to Grace being a transgender woman, but to her being woman married to another woman. This brings more tension into Grace and Zoe's already fraught relationship. The other couple whose story is told is a pair of 16-year-olds, Savannah (Piper Quinn) and Xavier, who identifies as a boy despite being born into a girl's body (Jayden Simmons). Their love seems easier than their grown-up counterparts; Savannah always knew who Xavier was, and loves him for it. But Xavier's home life is not to easy, and he runs away from home to his new friend Grace, whom he met in an online support group. The two couples have different experiences and are at different stages in their transitions and their lives, but seem to take some comfort and support from each other. Everyone in the cast (which also includes Zealot Hamm and Katherine Engel playing multiple varied characters) gives such open, vulnerable, moving performances. Some of my favorite scenes are those of Zoe's dreams of taking flying lessons, which are really about her figuring out how to be herself in relation to and independently from her different yet same spouse. Another interesting element is that of religion vs. faith. On the one hand, Grace's church is intolerant, close-minded, and discriminatory towards her. On the other hand, her faith is obviously very important to her and gives her the strength to be herself, and she desperately wants to find a way to marry those two opposing sides. It's a common dilemma: how can you stay in a church you believe in when it no longer supports you or fully represents your beliefs? At the end of the play, it's unclear where everyone is going from here. But they're continuing on their journey, a small piece of which we've been privileged to experience with them. It's so important to walk a mile in someone else's shoes, and theater is a great way to do that. It allows us inside the lives of people who are different from us, and makes us realize they're really not all that different after all. We all just want to be our authentic selves, to be loved and accepted for that, and to do work we believe in. 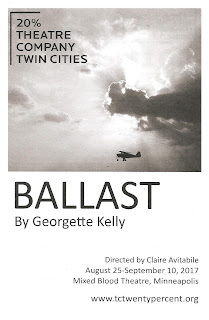 Four more performances of BALLAST remain, with tickets $5-$25 on a sliding scale fee.